Any tips for tuning floating chamber 1911 22/45? I purchased a NOS Colt conversion unit here on Marketplace, and mated it to a Norenco 1911 frame. The problem is brass not being ejected cleanly and getting stuck between the barrel and slide. At first try it did not eject ~ 10% of the time. After dressing the 22 ejector blade I got a slight improvement. After taking a stock 45 recoil spring and cutting it down coil by coil I got a slight improvement. After removing the 22 extractor alltogether I got a large improvement. It appears that enlarging the ejection port would help. It still won't hold the slide back after the last shot, but I think the slide release is not correct, should be a #2, but is unmarked. Does anybody have any info to get this thing to a less than 0.5% or less failure rate? Do i lube the floating chamber or run it dry? Are there any dependable aftermarket magazines of any manufacture? Colt mags look like they are $120. I gave my very dependable Ciener 22/45 kit to my nephew, and purchased this Colt kit because I always wanted a Service Ace, but tuning this thing is starting to annoy me. Run the mated areas of the floating chamber and barrel wet with CLP. After 100 rounds or so, juice the seam between those 2 parts again by drizzling some CLP at the ejection port while the gun is in battery. Repeat every 100 rounds or every range session until you hit north of 500 rounds, then it is time to strip and clean. 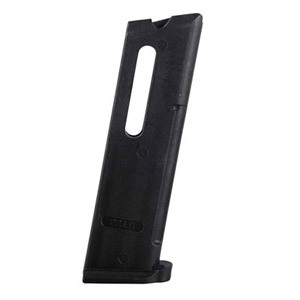 Mags can be substituted with GSG (German) 10 round 1911 / 22 mags at less than 1/3 the cost of Colt mags. You lose the last round hold open function with the GSG mags, but they are reliable. These are a totally different design than OEM Colt mags. Nobody has ever made a good Colt mag copy. You need a #2 slide stop and a good bend on the extractor, plus a 14# recoil spring (Wolff Gunsprings). An example of the mags you want and can find them on sale for under $30. Kimber makes polymer mags for the 22 conversions they put out and that have worked well in my gun. 22LR is nasty and covered with wax, cleaning is the first place I start and the chamber area. Then I would check the recoil spring, I think they are 10#. As I mentioned above, for Colt Conversion Unit it's 14lb. 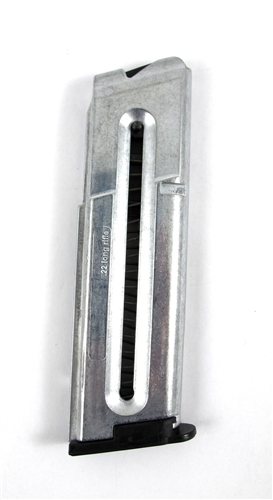 recoil spring, as per Colt and Wolff. I have a 14 lbs spring ordered. It seem the recoil spring it came with is pretty stiff, and short. the pistol ejected more consistently. Sorry to hear the mags don't work for you. The ones I linked are the ones I use. Don't know about SIG/Walther differences...? After I received a tip and discovered the GSG mags, I sold off ~18 OEM Colt mags and replaced them with the GSG. Invested the proceeds in a nice, no prefix S&W Model 41, an extra barrel, and a whole pile of vintage S&W mags. I believe I had 2 or 3 Colt Conversion Units for 2 Colt frames when these revelations happened and the GSG mags worked with all, minus the slide lock feature. I've had about 6 of the Conversion Units in recent years, but only 1 now. I quit at 10 GSG mags. It was difficult, being's I'm a mag whore. I shoot rimfire through rimfire guns. Have never liked conversions personally but just a preference. Not a thing wrong with them for folks that like them but my custom 10/22 and Anschutz rifles along with custom Ruger rimfire pistols, pair of Berettas plus pair of Smith 41's. Pretty much covers my desire to shoot rimfire and the shooter is the limiting factor not the equipment.